Dr K P Rao is the one who first developed Kannada software and Kannada fonts. He is very simple, down to earth, ready to help anyone at anytime and preferred low profile. He was never for name and fame. Because of this of his low profile attitude he was never considered for this award earlier. Phonetic keyboard in Indian Languages Software’s is dedicated to his name with K P Rao Keyboard. 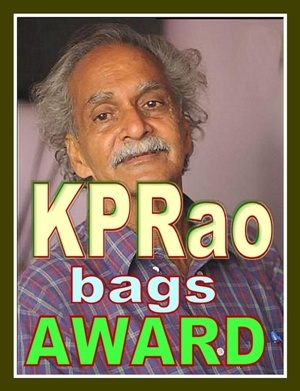 Kinnikambla Padmanabha Rao, better known as K P was born on February 29 1940. He is a unique composition of academics and industry, which undoubtedly has been of immense help in bringing out path breaking researches. Early Kannada software, a script-enabling one, was largely geared towards desktop publishing (DTP). Shabdaratna, Venus, Prakashak, and Sediyapu were some of the software that brought publication activity to computers from manual typesetting. This was the mid-’80s when the PCs were just coming in. K P Rao developed free Kannada software that was the basis for other software such as Nudi and Baraha. He also adapted the English QWERTY keyboard so that it could be used by Kannada and other Indian language scripts. The very popular layout that Nudi software uses for Input is K P Rao’s phonetic layout for Kannada. Professor K P Rao had worked on similar phonetic layouts for other languages as well. K P Rao is the author of Sediyapu, probably the first ever popular software with Kannada on the computing scene. It became popularly known as KGP Layout or Nudi Layout since KGP adapted it. The government of Karnataka took the initiative in standardizing Kannada on computers and notified the standard font for Kannada and a keyboard layout in 2001. This layout is nothing but a slightly modified layout of K P Rao’s. GoKhas also released a free software by name Nudi adhering to the standards. The prestigious ‘Nadoja’ (teacher of the State), which is equivalent of the honorary Doctor of Letters degree, was conferred on K P Rao for his contributions towards the development of Kannada keyboard and developing a software to use Kannada language on computers. He has worked in BARC, TATA Press, Monotype Ltd, Manipal University and IIT Gowhati. He has 3 technical book publications and numerous journal articles. His biography, titled, ‘Kannada, Computer mattu K P Rao,’ is under way and will soon be released for the readers. Congratulations best of luck for the remarkable achievement. I was also in the race, Please wish me for next time.